The best product so far. Planning to buy one more cookware set for my family. super quality... vareities of designs and style in one combo for daily use. I am using this product form last few months and still its all good.... Thanks Naaptol for this affoardable deal. The utensils are highly durable and ideal for daily use. 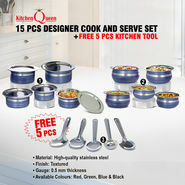 Highly recommended if you are looking for cookware at an affordable deal.